VISIT US FOR THE REGISTRATION OF YOUR 2014 COLLEGE OF EDUCATION IN AFFILIATION WITH DELTA STATE UNIVERSITY ABRAKA. (JAMB & POST UTME FORM) WHEN IT IS OUT. NEWS UPDATE: JAMB Admission form into College of Education Warri in Affiliation with Delta State University Abraka, for 2017/2018 Session now Out. Click here for more detail on how we can help you buy and process it. (i) All candidates who chose the Institution as either their first and/or second choice and scored 180 and above in the UTME for the 2014/2015 Admission Exercise are eligible to participate in the screening exercise. (ii) Those who did not choose the Institution but wish to be considered for admissions and scored the afore-mentioned cut off mark are also eligible to take part in the screening exercise. (iii) Those who chose the Institution as either first/or second choice in JAMB Direct Entry and must have Obtain a Diploma degree from Delta State University Abraka. Date of Post UTME: 21st of September 2013 at the COE Warri Campus. A minimum of merit in NCE and Diploma in Education (DELSU) in relevant discipline, English Language and Departmental Requirements. 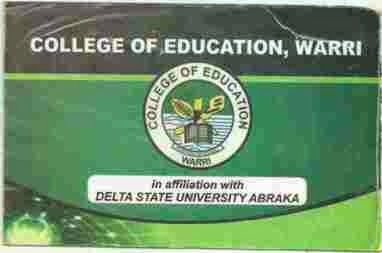 Is this College of Education, Warri affiliation with Delta State University Abraka. Answer: St Charles Educational Service. What is the safest time to purchase the post utme form? that bank close their services at about 4:00pm. How long does it take if you are to assist in purchasing the scratch card for me. I’m interested, i want you to buy the post utme scratch card pin for me without coming to delta state, how is it possible? Can i use my phone to register for the post utme? to do online registration. so i will say no to it and do not try it. there, ask of Fasco Table Water Building or call me. Can you help me of any information on how the post utme question look like? From my personal interview of candidates who sat for the screening exercise in different years. The below information is gotten. do you have any material that can served as a guideline on how the questions look like. Yes, i call it LIKELY EXAMINATION QUESTION AND ANSWER, it helps you prepare and have an insight as to what to expect during the post utme screening exercise. After payment of the said amount (N500) to the bank account i sent to you on request. university in Nigeria, click here for more details. To get update when the 2014 form will be on sale. 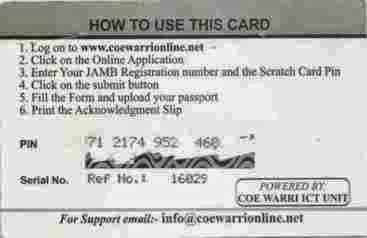 send an sms to 08051311885 stating the name of the form i.e “College of Edu. Warri in Affiliation with DELSU” you want to get update for. we promise to inform you when it is out.